Ameir and I spent the day in Damascus after our wedding in Dar’aa. We took the bus to and from, and spent the whole day walking around the narrow alleyways of the old city and eating delicious food. We had enjoyed dinner at an old traditional Arab mansion that had been converted into a beautiful restaurant. Now, it was time for dessert. 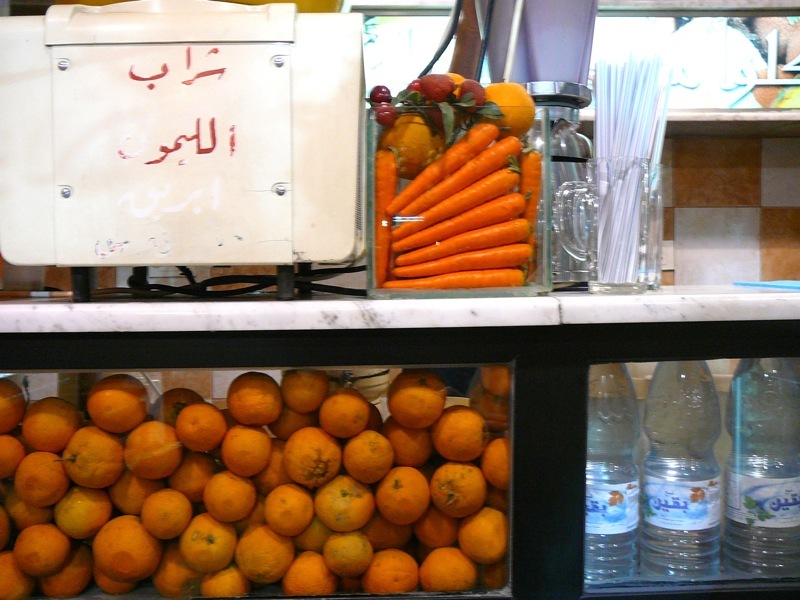 Damascus is known for Mahal ‘Aseer – juice shops. They’re the perfect source for “street drinks” – refreshing in the daytime heat and the perfect thing to round off a dinner of Shawarma or Falafel. There was a juice shop across the street from the bus station, so we picked up moz wa haleeb – banana milk – before getting on the evening bus back to Dar’aa. The seatbacks had cup holders on them, and Ameir and I put our drinks there while we got situated. Unfortunately, one of the cup holders was broken, and Ameir’s moz wa haleeb spilled everywhere. Everywhere. We had no paper towels…..so we just moved to a different seat and pretended nothing happened. *shame* Once we sat down, Ameir said, “Hurry, chug your banana milk and get rid of the cup so no one knows it was us.” I did. The lingering question: Should I have admitted this on the Bar application? 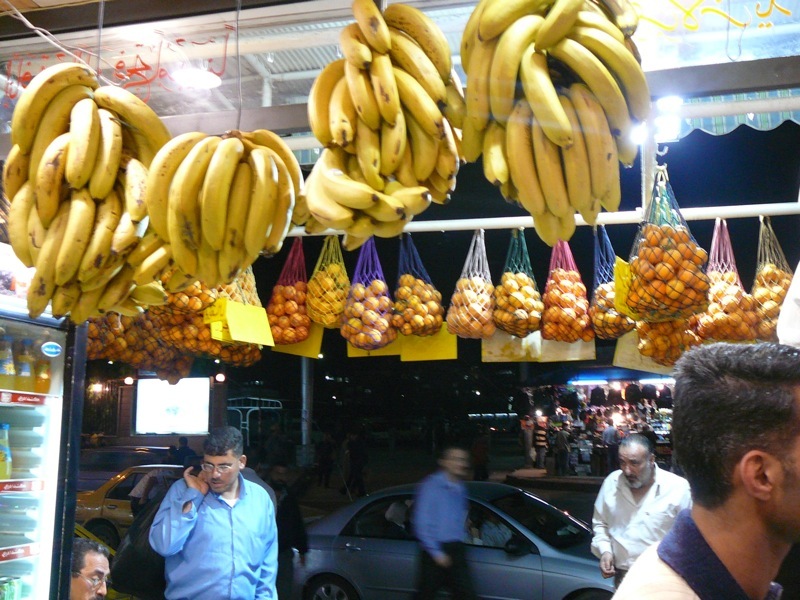 My favorite Juice Shop creation is this famous Moz wa Haleeb – Banana and Milk. It’s not as thick as a smoothie or milkshake, so it’s very hydrating and full of quick nutrition as well. 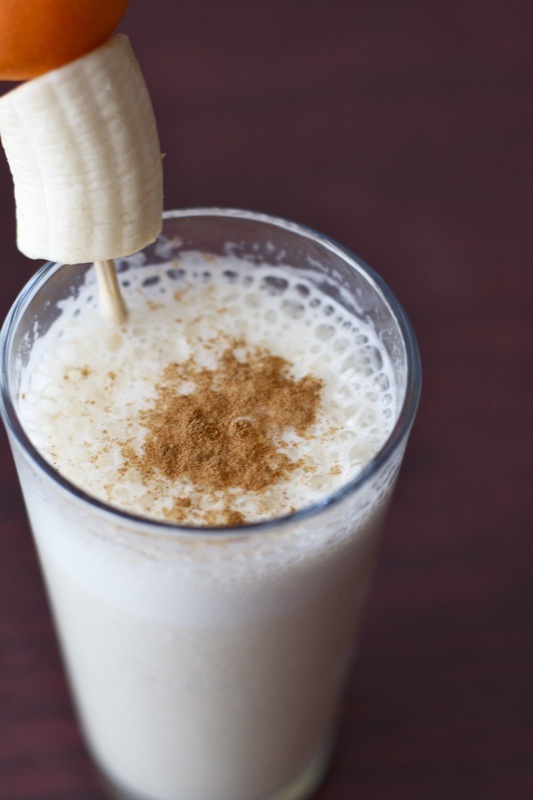 It’s very simple to make at home and is a great way to use up overripe bananas (and get kids to get fruit and milk without having to involve ice cream). I enjoy recreating the memory and none of the mess at home. 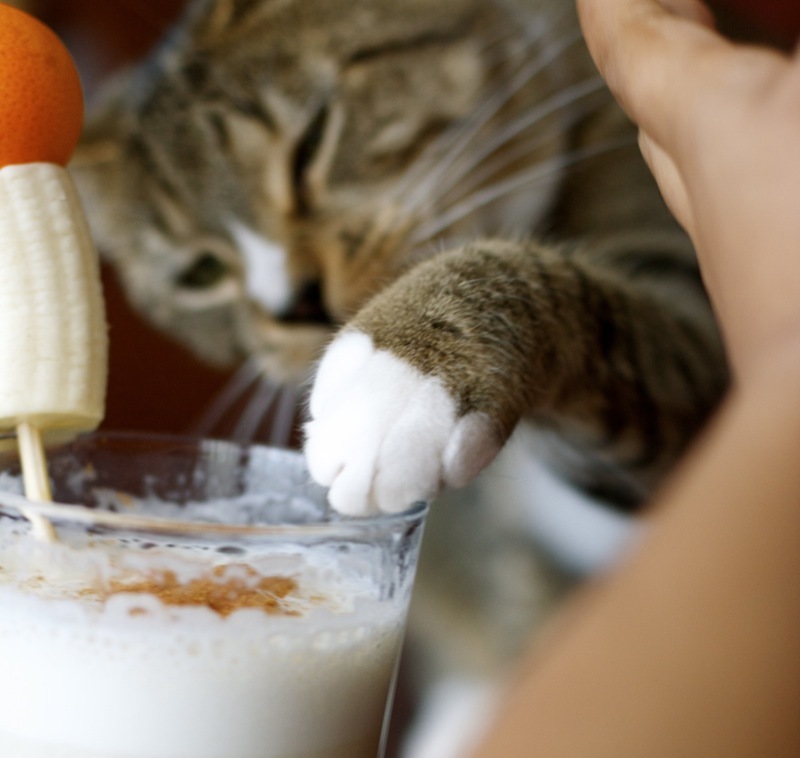 The consistency is the important thing, and I’ve worked out the proportion of banana to milk to get it to match the Juice Shop version as well as possible. Blend all ingredients. You’ll end up with three cups of drink + foam (and the foam is really delicious too. In my experience, you get more foam from an immersion blender than a regular blender). The most important step: Try to prevent your cat, Molly, from taking a dip while you’re taking a picture. Silly kitty. I had troubles finding it on regular recipe sites, but this is perfect! I haven’t even tried it, but thank you nonetheless, I’m definitely trying it later today. Nice photos, too.